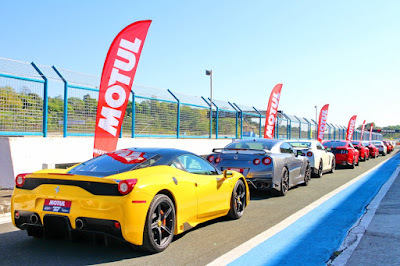 An estimated 80 supercars and more than 110 tuned cars took to the track to celebrate the first Motul 300V Super Fast Track Day. Held at the Clark International Speedway, the event promoted a safe environment to push both man and machine to their limits. It also let users and patrons test the real performance and engine protection qualities of Motul fully-synthetic engine oil and lubricants. The Clark Speedway bristled with machines built for speed from exotic cars including a Lamborghini Huracan Super Trofeo to a bevy of Porsches, Nissan GT-Rs, and event supporters Lotus Cars and Subaru. Inspired by Motul’s 300 victories in competition, the 300V is the world’s very first fully synthetic engine oil. Using ester technology first invented for the aviation industry, Motul has become the preferred engine oil in motorsports. In the Philippines, Motul is exclusively distributed by AutoPlus Sportzentrium located at 233 EDSA, Mandaluyong City.